Sorry it's been so long since a highlight was posted! I guess real life caught up with me and held me captive for a while! But I'm baaaaaacckk!!! 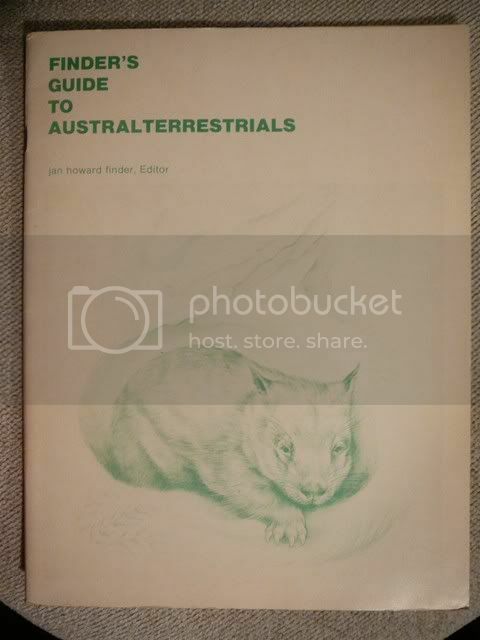 Finder's Guide to Australterrestrials is edited by jan howard finder. There were 500 'Special DUFF' editions signed by jan howard finder. (no I didn't forget to captialize his name, that's how he does it) Published in 1981 by Wombat Enterprises, Unlimited with ISBN 0-9605722-0-1, the book is stapled together with a paperback cover and is 8 1/2 X 11 in size. jan howard finder wrote the factual commentaries on the animals but well-known science fiction authors wrote small fun commentaries about the animals. Anne's is about the Red kangaroo and is three short lines long and consists of just 9 words! The books were published to raise funds for DUFF (Down Under Fan Fund). I don't know if DUFF still exists, but it was originally a fund to provide funds so that a science fiction fan could travel across the Pacific to visit with counterparts in Australia or North America. Candidates were voted on by interested fans from all over the world. This is the front cover of the book. 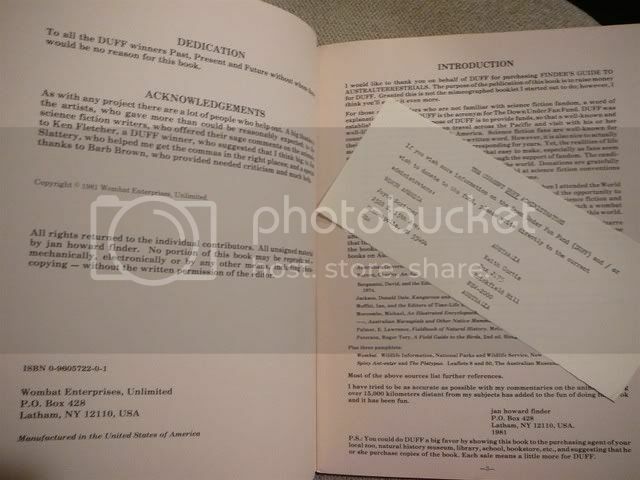 And here is the copyright page along with a slip that was included with the book that gives info on who to contact for more info about DUFF. 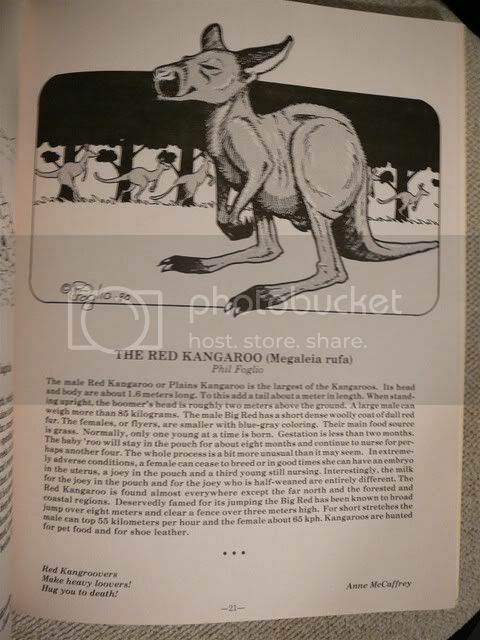 Here is the page about the Red Kangaroo with Anne's commentary in the lower left corner. Told you it was small!!! The animals found in the book include the black cockatoo, black swan, Boyd's forest dragon (which I wish Anne had commented on, wonder why? ), platypus, koala, kiwi, great skua, numbat, thorny devil and many other unusual animals from Down Under. Almost all animals are accompanied by a drawing of that animal by many different artists. This is one of those obscure things by Anne that I love to find and add to my collection. Also - according to Cheryl.......Finder (pronounced "FINN-der" not "Fine-der") is an inveterate con goer known to many as "The Wombat". He is in charge of running Albacon this year. Last edited by Becky; Feb 21 2008 at 09:59 AM.